My kids are always excited when a box comes in the mail for them instead of for me. Can you blame them? They get to try some really fun items, and I get to watch their expressions. I guess we all get pretty excited! 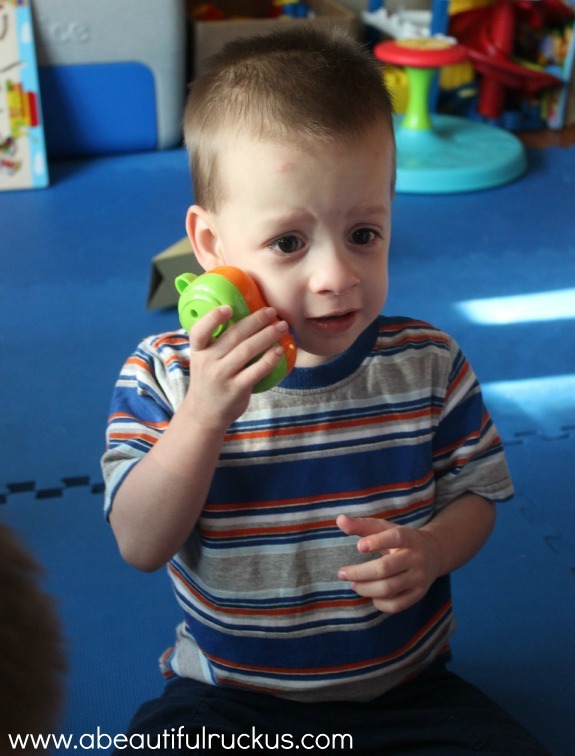 This week, my kids got a box with a special toy in it from VTech. 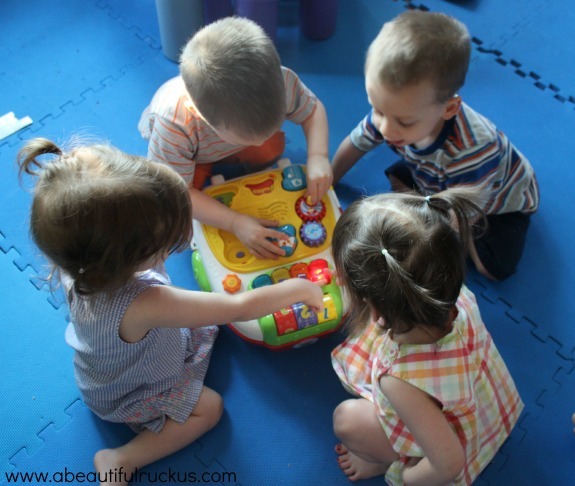 This is definitely not their first VTech toy as I've discovered that they have one of the largest lines of electronic toys geared to help infants and preschoolers hit developmental milestones. 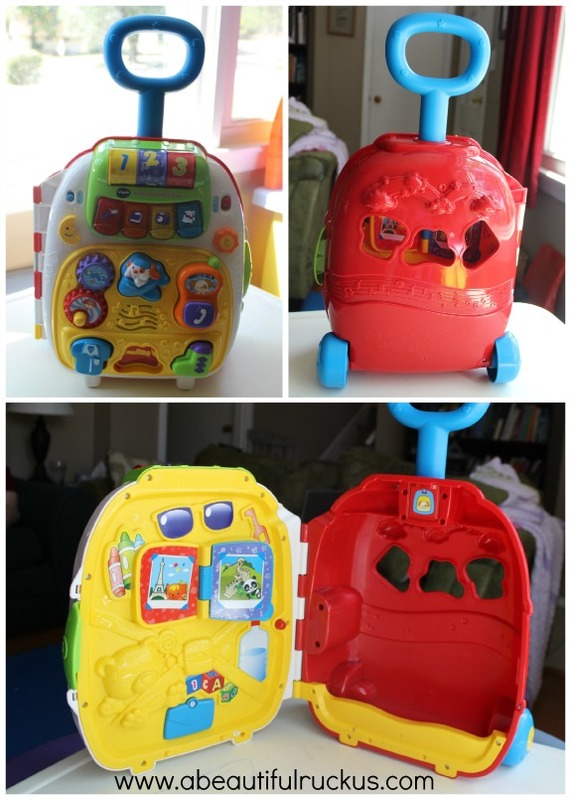 The VTech Roll & Learn Activity Suitcase is no different! With plenty of buttons to go around, the kids were all able to explore it all together when Daddy took it out of the box. Which is a good thing, because this toy was mobbed! Geared for ages 6-36 months, the VTech Roll and Learn Activity Suitcase is perfect for the preschooler who is exploring the world. Approaching learning with a travel theme, it has two different modes. One says the words for each item, and the other plays over 25 songs. Everything from opposites like "open" and "closed", to greetings in English and Spanish, to first words, types of transportation, and famous places are all included in the toy. It also comes with pieces in the shape of clothes to match on the front, and a shape sorter hole for those same objects on the back. There are gears, rollers, keys, and buttons, as well as the latch to open and close the suitcase. I'm actually impressed with how much they worked into this one toy to help language and motor skills! One of the things we are working on with the kids is imaginative play. Caleb knew exactly what to do with the cell phone on the front of the suitcase. He even said, "Hello? ", which is a very exciting accomplishment in our world! I'm hoping the suitcase continues to encourage him to talk. When Ellie was able to get the suitcase to herself, she didn't waste anytime in acting like a real traveler. She would drag it across the floor, park it for a minute, and then drag it back again. 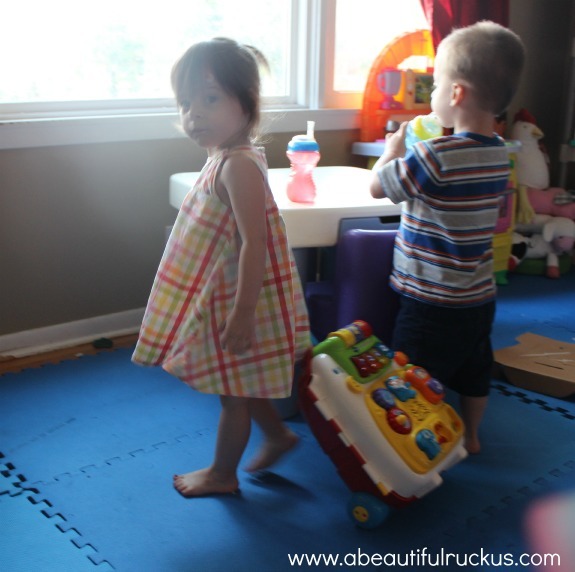 The handle is at the perfect height for my little ones so they find it easy to maneuver and enjoy. While there isn't enough room on the inside to actually pack clothes for a trip, there is still enough room to put a few toys in it and drag them from one side of the room to the other. It's definitely been getting some mileage over here! 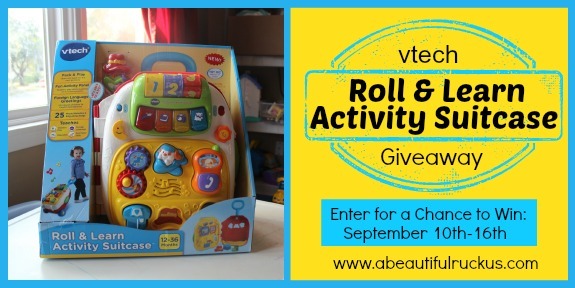 Would you like a VTech Roll and Learn Activity Suitcase for your house? They have kindly offered to send one to one A Beautiful Ruckus reader! All you have to do is enter below for your chance to win! The first two tasks are not optional and must be completed to qualify for this giveaway. The additional entry tasks are optional. Winning entries will be validated prior to announcing the winner with an alternate drawn if the entries cannot be verified. The contest ends at 11:59pm on Monday, September 16th. The winner(s) will be randomly chosen and contacted by email on Tuesday, September 17th. The winner(s) will have 48 hours to respond to the email with their information so that the prize can be forwarded to them. A Beautiful Ruckus is not responsible for the delivery of the prize and is not responsible if the sponsor does not deliver. This giveaway is open to residents of the United States. A Beautiful Ruckus received complimentary item(s) for review in exchange for hosting this giveaway from VTech. No other compensation was provided. This post may contain affiliate links. For more info, please see my disclaimer page. I like the catch me kitty. Would love to have the Go! Go! Smart Wheels Airport Playset for my grandsons! I really like the Innotab2. I also noticed a great accessory pack to go with it. Suitcase would be a hit for sure, but my son would absolutely love the train Station playset!! I like the alphabet cube set. 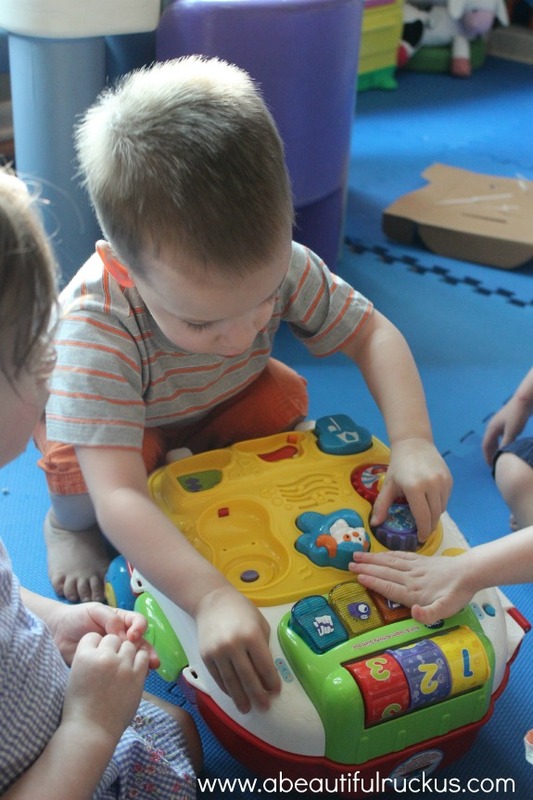 we love the vtech toys! We have several of them but haven't seen this one yet! Would love to get the Innotab 3S for my 2 elementary munchkins. I'd love to get the Innotab for my little girl! Thanks for hosting! The Innotab 3S is on our Christmas list this year! We like the 2-1 cook play set! My grandson would like the MobiGo 2 Touch Learning System. we love so many of them. I think my boys would love the Spin and Learn Adventure Globe! We have SO many VTech toys already. I'd like to have a few more of the Smart Wheels sets. Maybe it's just me, but I love the Kidizoom camera :-) I'm an amateur photographer and that looks like something my little girl would enjoy using along with me. I love the Touch & Teach Word Book! I would love to have the Innotab 3S for my son. 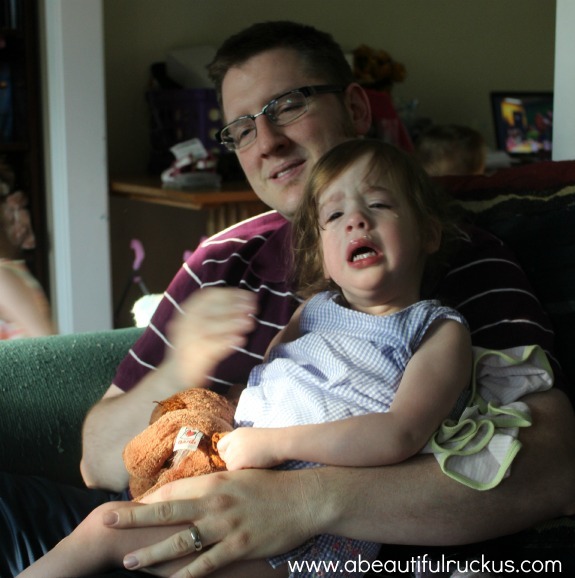 My daughter would love the Slide and Talk Smartphone. I love the Move and Zoom Racer. I also like Cody the smart Cub. I want the Innotab 3! i want the vtech innotab 3 ! Oh I would also love the Bouncing Colors Turtle! I really like the Infant Alphabet Cube Gift Set. We would love the KidiBeats Drum Set - Pink. My youngest would love their switch and go dinos. I think my daughter would love the pink inno tab! The Brilliant Creations Advanced Notebook looks like a great toy. I would like to have the InnoTab 3. I'd love the 2-in-1 Shop & Cook Playset for my daughter as well! I would love to get the 2-in-1 Shop & Cook Playset - Pink for my granddaughter. I have been wanting to get my daughter the InnoTab 3. My little one would looove the lil smart top! He sees it in the store and wants it! The gogo smart wheels playset for my poor boys who are overrun by girl toys from big sister, and the kidibeats drum set for my girls who love love love music. The Innotab 3 and mobigo2 pink for our older daughter. Our quads and big sis LOVE vtech toys! I like The Count and Colors Bouncing Frog! We'd love to have the Switch&Go Dinos!